Barley or Hordeum vulgare in Latin is a cereal grain and a member of the grass family. It is mainly used as an animal feed and also for malting and is a key ingredient in beer and whisky production. Promote healthy blood sugar: The fiber content in barley will prevent blood sugar levels from rising too high. Those suffering from Type 2 diabetes should consume more barley. Reduce cholesterol: Beta-glucan from barley’s soluble fiber is responsible for lowering cholesterol. Lower the risk of some types of cancer: Barley is rich in selenium and together with fiber it helps prevent colon cancer and breast cancer. Heart friendly: Regular consumption of barley reduces heart disease. In 2005 the Food and Drug Administration (FDA) announced that whole grain barley and barley –containing products are allowed to claim that they reduce the risk of coronary heart disease. It is a good source of niacin, a B vitamin that provides numerous protective actions against cardiovascular risk factors. Weight management: Barley is good for the control of weight and obesity as it is rich in beta-glucan soluble fiber. Eating fiber-rich foods may help increase satiety or a feeling of fullness. Protection against childhood asthma: Consumption of barley could help reduce the risk of childhood asthma by about 50%. We often boil barley in water as a refreshing drink. It reduces heatiness and after drinking, it stimulates urination. The other healthy dessert among Chinese in Malaysia and Singapore is a mixture of 薏米, 腐竹, 白果 (yimi, fuzhu, baiguo) barley, beancurb skin and gingko nuts. As an executive your job is to create an environment of high morale among the staff to boost productivity. 1. Offer more autonomy: Do not supervise too closely. Let the staff make their own decisions and encourage them to take initiative. 2. Do not intimidate: Workers will not perform well under too much pressure. It is more productive when you create an environment that makes it easier not harder for workers to do their jobs. 3. A concern for the workers: You are approachable and considerate of their feelings and are able to listen to their problems. In addition, you show your appreciation when a job is done. 4. Treat the staff fairly: Nothing kills the morale of the staff more than playing favoritism. Treat them all fairly so that there is teamwork among the staff. 5. Reward the staff on performance only: This sends a clear signal to the staff that you need to perform in order to be rewarded. Tie pay raises to performance rather than seniority. 6. Training and coaching: Establish a career path for the staff by providing on-the-job training so that they can be promoted within the company. 7. Staff recognition: Establish customer feedback systems to recognize employees who perform above and beyond the call of duty. Building morale is no easy task and it is the daily effort of maintaining a healthy and conducive environment for the staff. The concept of Google’s sandbox is like a new staff who has just joined a company. He is under a period of probation. Upon confirmation he is like any other staff in the company. As for Google’s’ sandbox the probation period could be 90 days to 120 days. Most probably it is used to discourage spam sites. While your site is in the sandbox you still continue to post unique and original articles and add new incoming links naturally. PageRank is Google's indicator of an individual page’s value. Google assigns the importance of a site on a scale of 1 to 10. The more the number of quality sites that link to a page the higher will be its PageRank. Google interprets a link from page A to page B as a vote, by page A, for page B. However, Google looks at more than just votes. The most important thing to do is to post compelling articles on your site and allow links to come to you naturally. According to a Google insider, the best links are one way and freely given. Do not buy or trade links as there is a Chinese saying that says: 弄巧反拙（nong qiao fan zhuo）. It means when you try to be smart you end up defeating your purposes. Leaders are concerned about getting the job done and managing the people doing the work so that they are motivated positively to produce good results. The trick is to balance the two well. 2. Human relationships: Treat your staff like normal human beings and be a good listener. Your staff will respect you more when they can discuss their problems with you. Be honest and truthful to the staff. 3. Do less and supervise more: Delegate more of your work by training and coaching the workers. Encourage them to make independent decisions and give them more assignment when they are more capable. Check their work from time to time and show your appreciation when a job is done. 6. Lifelong learning: In order to stay on top of what is going on you need to constantly expose yourself to new ideas that affect your job. New concepts, new practices and new procedures are continuously replacing the old ways of doing things. Keeping yourself up-to-date by ongoing learning is the only way to survive in the corporate world. 7. Be Healthy and fit: As a leader your job is demanding. A fit and healthy body and mind are definitely essential to cope with the workload and the pressure from the people at the workplace. One of the reasons why Obama is chosen as the next president of America is because he is younger, more energetic and fitter. How do you get your work done so that it is completed in the shortest time with the least trouble but without scarifying quality of work? 1. Be a good organizer: A good organizer is able to look at the big picture and arrange his staff, equipment and the limited time to fit into the most orderly and productive working pattern. A good organizer plans ahead and he follows the plan. With a plan he sets specific goals that he is able to measure his progress at regular intervals. He knows the right things to do rather doing things right. He installs simple procedures for every one to follow so that work gets done smoothly, effectively and with the least problems. • Plan ahead: When you plan ahead and allocate the workload well your job gets done in the smoothest way and done right the first time. Proper planning and effective use of time go hand in hand. • Do first thing first: Do the most important things first and do not be sidetracked by unimportant interruptions. • Delegate more of your work: Allow your subordinates to do the routine job and you can have more precious time to plan ahead. Getting things done smoothly with the minimum hassle is the result of advance planning, good organization and proper allocation of work within the prescribed time. It also means effective use of valuable time at work. It is vitally important to keep the staff posted about things that affect them, their department or their company- good or bad. A free flow of information will improve morale and productivity. 1. Communicate clearly, fully and regularly: It is always good to talk to the staff face to face clearly and fully about an issue, so that you can get immediate feedback from the staff on the spot. Communication is a two-way process that involves listening and responding to messages as well as giving them. 2. Giving order: Giving orders are not as simple as it sounds because it may not be carried out correctly. It is good to ask the people to repeat your instructions in their own words. It is also important to encourage them to ask questions. The other aspect is about the way you give the orders. The best way to give an order is to ask the person to do something rather than telling him. It's an order anyway but it is more pleasant to the order taker. It’s a good habit to offer a brief explanation when you want something done. When the instruction is fully understood the chances of making mistake are greatly reduced. It is also necessary for you to follow up to see that it is done accordingly. It is better to correct a small problem than a big problem later. When the instruction is carried out remember to show your appreciation as soon as possible. • You must have a very clear idea about the subject to write. • Get to the point quickly with a very short introduction. • Keep your sentences and paragraphs short and use simple words. • Try as far as possible to put them in bullet points. • Write naturally like the way you talk to someone in front of you. It’s friendlier. As you move up the corporate ladder your ability to communicate clearly, precisely and briefly in spoken and written words is one of the most important skills. 1. Fuel efficient vehicle: For a start purchase a fuel efficient vehicle especially a small car with a manual transmission. 2. Extra weight: Remove unnecessary items in your car. Extra weight means extra petrol consumption. 3. Close the windows: Closed windows will reduce drag and improve fuel economy. 4. Fuel tank level: Pump petrol as soon as it is one quarter empty. The later you pump means extra work on the car’s systems. 5. Tire pressure: Maintain the tire pressure at optimum level for better fuel savings. 6. Wheels: Use the normal-sized wheels instead of wide wheels as more friction will greatly reduce fuel efficiency. 7. Regular maintenance: Your maintenance should include changing of engine oil. Remember to check spark plugs, fuel filter and air filter. 8. Air-conditioning: Turn off the air-conditioner whenever possible for fuel savings. 9. Pump petrol: Do refill early in the morning or late in the evening because gasoline is densest under coolest time of the day. 10. Driving style: Drive smoothly. Do not brake or accelerate hard. Always use higher gears. 11. Waiting: Turn off the engine when you know it is going to take a while. 13. Avoid high speed: As you increase your speed your aerodynamic drag also increases thereby increase fuel consumption. 14. Cruse control: Over a long distance a constant speed often saves gas. 15. Avoid short journeys: Cold cars consume more petrol. You save considerable amount by walking for short distances. Set a Good Example: Setting a good example is a powerful tool because your workers observe your actions as you go about your daily work. As an example, you want your staff to come on time and you are late you don't expect your staff to listen to you any more. You take it easy when the boss is not around .You don’t expect your people to act differently when you are not around. Example has more followers than reason as pointed out by Christian Bovee. Honesty is the best policy: Your subordinates expect you to be truthful, straightforward and have their interests at heart. Some executives only tell the staff what they want to know and not the complete story. Communicate clearly and don't mislead the staff and always deliver what you have promised. There is a saying: Half a fact is a whole falsehood. Appreciation: Most workers do not mind working hard but they expect their effort to be recognized and appreciated. Whenever you notice a job well done remember to show your sincere appreciation. Do not wait until they goof off and you try to harp them. This is the worst option to motivate your people. Be quick to praise. People like to praise those who praise them. Avoid Intimidation: Do not apply pressure or create fear among the staff. It is counter productive. The staff will spend more time worrying about their jobs than doing their work. Staff are motivated by persuasion, encouragement and the promise of some reward. Treat all staff equally: Do not play favoritism because it will create jealousy and resentment among the workers. Assign work fairly and reward the staff based on performance only. When you treat staff equally you create teamwork among the staff themselves. According to Jack Welch, a business executive, the world will belong to passionate, driven leaders - people who not only have enormous amounts of energy, but who can energize those whom they lead. It's time for you to join some blog directories when your blog is filled with many pages of articles. When you join the directories you are getting a better exposure for your blog and you are able to get some one-way backlinks to your blog. You are also attracting other members of the blog directories to visit your site. Webring: When you join Webring you can participate in their various communities such as Lifestyle Changes for Life, Blogs and Blogging and Creative Writing. For each community that you join, there is a backlink to your site. When you join four communities you have 4 links to your blog. Bloggingfusion: This directory is able to tell the number of indexed pages by the various search engines, your PageRank, your Traffic Rank and many more things about your blog. Technorita: It is more than a blog directory, it is a search engine searching for blogs. It has indexed 133 million blogs since 2002. It provides you with your authority rating, the bigger the number the better your authority on the topics that your have blogged about. It also gives you your blog ranking among all blogs. Mybloglog; It tracks your latest articles that you have posted up to 25 days. Every article listed is a one-way link to your site. Nature-ally.com: When your blog is related to heath you can join this exclusive directory. And it rates your blog just like PageRank. Blogtoplists: When you are a member you are able to see your popularity ranking among all members. Ranking is decided by unique visitors to your blog. Visitors can cast votes to increase your ranking too. Malaysian blog directories: As a Malaysian I support Malaysian blog directories. I am a member of http://blogmalaysia.com/ and http://www.malaysiaontop.com/. When you visit a website and you like the articles very much and you want to read future posts. What do you do? 1. You don’t have to supply your email address, so you are not exposed to threats associated with email such as spam and phishing. 2. When you want to stop receiving, you just unsubscribe or remove the feed from the aggregator. 3. It is easier to manage because one feed is from one source unlike email every thing is in one place and you have to sort them out. 4. When you bookmark, you wouldn’t know the website is being updated. When you visit a site look for RSS or XML or the icon as shown here, these signs mean that you can subscribe to its feed. There are two formats of feed, RSS and Atom. You click on the icon to subscribe to its feed. After that you can view its content at your web browser. 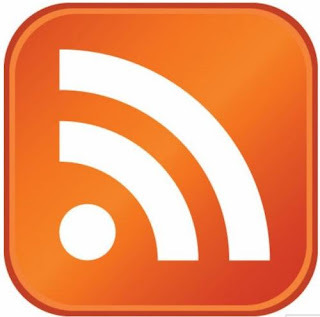 A feed reader (works like an automated email program) also known as RSS reader, feed reader, feed aggregator , news reader or just aggregator is able to follow many web feeds at once – a process called aggregation. It is able to check for new content at user-determined intervals and retrieve the update. You don’t need to bookmark many sites and check your email; the content comes to you in one place. Check the traffic to your blog from these feed directories after submitting your feed URL. I love cookies; I mean butter cookies, especially those from Denmark. Those cookies are yummy to most of us. But the internet cookies are not necessary the delight of every one. When you visit a website you may notice that it is telling you: Welcome back for your second visit.” This is the work of a cookie. A cookie is a small text file stored on your computer’s hard drive when you visit a website. A cookie is like an identification card. It is uniquely yours. It allows a website to know the pages and the services you use when you are there. Cookies provide information for websites about the things that are important to the customers. It is also used to keep track of you and your shopping cart by Internet shopping sites. You can also customize you home page with the help of cookies. Every time you request for your custom home page your cookies are sent along with results to tell the server which items to display. You can decide not to accept a cookie whenever a cookie is offered. When you block cookies you also prevent some online services from working. It cannot deliver compute viruses and it will not damage your files or systems. It can’t erase data and scan your hard drive and gather information about yore passwords, credit card numbers. This is not an executable program and it cannot do anything to your computer. A cookie is only sent back to the server that originally sent it to the browser and to no one else. Most cookies are removed when you quit your browser. There is another type of cookie known as persistent cookie which is stored until its expiration date. All cookies have an owner and the owner is the domain specified in the cookie. When you visit a website, say, http://www.abc.com/ and the server places a cookie on your computer which is http://www.abc.com/. It is a first-party cookie. However, when you visit http://www.abc.com/ and a cookie which belongs to http://www.123.com/ is placed on your website. That is a third-party cookie. More and more people are blocking third-party cookies. You can view you cookie files in IE7. Just go to Tools and then Internet Options. While you are at the General tab, under Browsing history, click settings and chick the View flies button. My son created his first blog and it went live on November 5 with seven posts. His interest is computer software. He is 15 and he did it all by himself. Submit his blog and sitemap to Google, Yahoo and MSN. Go to http://www.ipings.com/ to ping his site to various services. Submit his feed to feed directories such as feedraider.com and feedfury.com. From statcounter.com you can see the blog traffic for the first few days. According to statconuter.com, most of his visitors are coming from Digg.com. Also, his articles can be found on page 1 at Google Search. So it is a good move to take the above-mentioned steps for a new site. You can visit his blog at http://pcandsoftwaretips.blogspot.com/. The scientific name of cucumber is cucumis sativus. Like pumpkin, watermelon and squash, cucumber belongs to the family of cucurbitaceous. It has very high water content and it is low in calories. It has a rich source of potassium, magnesium, vitamin C and folic acid. • It promotes the flow of urine. • For those with rheumatic problem, its juice, together with the juices of carrot and beet, provides relief because it helps eliminate uric acid. • You can treat tired eyes and remove eye bags under your eyes by placing slices of cucumber over your closed eyes. • It is a natural diuretic (it increases the rate of urination) which is used by people trying to reduce their weight. • Its juice is soothing and refreshing for the skin and it is nourishing for our hair. • Its dietary fibers regulate cholesterol level and support bowel regularity. • Its magnesium content relaxes nerves and muscles and keeps blood circulating smoothly. In Malaysia and Singapore satay (barbecued meat such as chicken and beef), a popular delicacy, is eaten with slices of cucumber. Eating cucumber neutralizes the heaty effect of satay. Do you know in Malaysia there is a business entity by the name of Mouth & Foot Painting Artists Sdn. Bhd. (Sendirian Berhad in Malay means private limited)? It is a company entirely owned by seriously disabled members of the Association of Mouth and Foot Painting Artists. The Association was established in 1956. 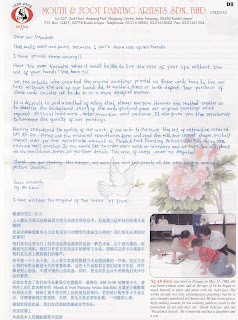 At the end of every year, I will receive a letter (see image) together with a set of greeting cards enclosed. As usual I will send them a cheque in return. 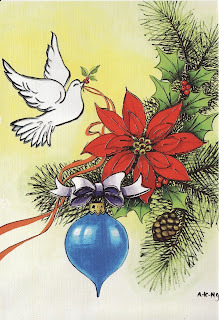 The Christmas card that you see here (by the way, I wonder the festive mood will be as merry as before) is crated by Ng Ah Kwai, the same person who wrote the letter. He is married and has a daughter and a son. His life is just as normal as any other human beings. Your support keeps them productively employed. Your appreciation of their work inspires them to crate art for you to enjoy. Your purchases and additional orders are really appreciated by them. You make them proud to earn their own living. Your satisfaction is their concern. Their motto is Self Help – Not Charity. They are only physically handicapped, but their artistry, their creativity and their imagination are without boundary. One Chinese proverb describes them very well: 自力更生（zi li geng sheng）. It means self-supporting for a new life. Mozilla Firefox was initially released in 2004. It is a free and open source web browser. It is currently running on version 3 released this year. Mozilla Firefox has been given quite a number of awards like CNET Editors’ Choice, June 2008 and Webware 100 winner, April 2008. One thing about Firefox is that it is only able to show the PageRank of my front page and not the inner pages. Internet Explorer does not have this problem. It is able to show the PageRank of all pages. Internet Explorer is currently running on version 8. It was released this year and its initial release was in 1995. It is doing a better job of showing my PageRank but it can’t pick up my www.statcounter.com widget on my blog. What a shame! Firefox picks up everything on my blog. According to statcounter.com’s report 58.2 % of the visitors came to my blog using IE and 37.8 % using Firefox. The balance of the other 4 % is made up of Opera, Safari and Chrome. It is very clever of Alexa Toolbar to show a list of similar sites to the site I am browsing. Most important of all it shows the Traffic Rank of the website that I am visiting. As for the Google toolbar I have enabled the Page Rank so that I know the ranking of the site that I am looking at. It’s so much easier to assess a site when you know its PageRank and Traffic Rank. As my PC is installed with Vista I can’t just yet add the Alexa Toolbar. I look forward to installing the toolbar soon. According to recent newspaper reports those borrowers who approach loan sharks are no longer confined to gamblers who are heavily in debt. Nowadays more and more professionals are going to them to get financial assistance. They are doctors, lawyers and even company chief executive officers. As reported in the paper, they are desperate and they have no choice and they are fully aware of the consequences. They are hit by the financial meltdown. The root of their problems is their lifestyle habit. The rich people work hard and they think long term. They invest their money to earn passive income. While the poor people use their hard-earned money to invest in their current lifestyle, because they think short term. The habit of managing money is more important than the amount of money that you have. As long as they follow these tips they will never need to approach loan sharks or “Ah Long”, popularly known in Malaysia and Singapore. * Save or pay yourself first 10% of your income for your retirement and children’s education fund. * Do not spend more than what you earn by using your credit cards. Inadvertently you are building up debts that you can't settle later. * Have a budget and always adhere to it. Your budget will cover your daily essential expenses as well as your monthly housing loan, insurance premiums and others. * Always set aside an amount to cover three to six months’ expenses just in case you are out of work. This is your emergency fund. You can’t live without money, but money is not everything in your life. Your life is made up of your health, your family, your relationship with others, and most importantly, your happiness. • Electronic Funds Transfer: The amount is deposited into your bank account in your local currency. • Local currency cheques: Google will convert your earnings from US dollars into your local currency and send you a local currency cheque. You can ask for Secured Express Delivery so that your cheque arrives quickly and safely. • Payment by Western Union Quick Cash ( Limited to USD 1,000 per Payment). • Payment by Rapida – the Russian version of Western Union. 1. It's free. There is no cost involved. 2. There is no need to wait for a cheque to arrive and it is subject to bank charges and long clearing time. 3. You only need to produce your personal identification document to collect your earnings at a post office in Malaysia nearest to where you live. You can even go to the nearest branch of CIMB Bank to get your money. 4. You collect your earnings in local currency after the amount is converted from US dollars. 5. It’s quick and no red tape. Western Union is a financial services and communications company based in the United States. The company is founded by Jeptha Wade in 1851. The company achieved revenue of 4.9 billion (USD) in 2007. It is a public company listed on the NYSE. You can go to their website at westernunion.com. As a person-to-person money transfer product it can be used as a money laundering tool. As for me and many other bloggers the most important thing is to collect our earnings quickly, hassle-free and without incurring any cost. Thanks to Google and the arrangement made with Western Union. The above results are extracted from statcounter.com’s (see image) report on Recent Keyword Activity. From the above you will notice that your article title decides the fate of your article.It can be highly ranked or buried among other articles. • A longer article title is better than a short one because a longer title tells more about your article content. As an example an article with the title “Heart –Love it or Die in 5 ways “is better than just “Heart”. A longer title attracts more traffic. • Avoid using junk words like:"a" or "the". Start your title with your article subject. As an example instead of using “The Health Benefits of Banana” start with the keyword: “Banana - The Health Benefits”. • The title should be compelling. For example a “How To” title and a title ends with” Tips “are very popular among readers. • Make sure that you can deliver the content to match the title or else the readers will be pissed off. • Be natural about the title. You are writing for your readers and not for the search engines. While the work itself and the working environment are stressful the pressure from the people at the workplace is even greater. 1. When you are in the good book of the boss your staff envy you outwardly but actually they are trying to sabotage you and make your life miserable. 2. You are being isolated from the rest of the team. They are worried that you will report their performance to the boss. 3. When you are good to the staff you find difficulties to reprimand those who do not perform. 4. Your boss gives you a deadline for an assignment but your subordinates give you all sorts of excuses to take leave. They are not cooperating with you. 5. Your staff override you and report directly to your boss. 6. Your staff‘s performance are outstanding but their salary increments are not commensurate with their productivity and they ask you to appeal to your boss on their behalf. As the company is facing cash flow problems you are under tremendous pressure to motivate the good staff. 7. There are limited vacancies to promote good staff in order to keep them in the company. 1. Stop working: When the pressure is overwhelming, leave the work aside temporarily. Relax you mind by doing meditation. 2. Change your thinking: Replace your negative thinking with positive thoughts. 3. Do the right things: Do what you believe is the right way to do and in the long run you will gain the support of the staff. Do not be disturbed by rumors. 4. A balanced life: Leave your work at the workplace, do not bring it home. 6. Health is No.1: Remember to take care of your health. With a healthy body and mind you can work smarter, better and more effective. 1. Working hours unpredictable: There is no proper allocation of workload and you are ordered to work overtime at short notice. When you do not do you are blacklisted. You cannot control your own time. 2. Rush hour: Even with proper planning you are still caught with serious traffic congestion problems. The delay is unbearable and when you reach the office you are totally exhausted. It goes on day after day. 3. Workload unpredictable: When you are busy you work under tremendous pressure. But when there is noting to do and you cannot do anything else, you are bored to death. 4. Routine tasks: Like data entries, the work is the same every day and the work needs your full concentration. The chances of getting occupational illnesses are high. Moreover the hope of getting promoted is slim. The work satisfaction level is at its lowest. 5. Noise pollution: Piling work is going on near the workplace. The old air-conditioner is making a loud noise. You colleagues are chatting away endlessly. 6. Poor lighting: Working too long under dim lights tires your eyes and numbs your senses. 7. Inappropriate working location: You work at a place where there is constant movement of people. Yon just can't concentrate on your work. 8. Air-conditioning: it is not at the optimum level. Sometimes it is too cold and at another time it is not cold enough. 9. Workplace location: The place where you work is inconveniently located. Either it is next to a busy junction where the traffic is heavy or the place is secluded. It poses a danger to you when you come to work and go home after work everyday. Do you see your sources of stress here? What can you do to reduce the stress? 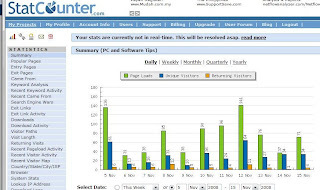 Isnare.com: At this site you are also able to know the number of times your article is viewed. Isnare.com is able to syndicate your articles for a fee. (PageRank: 5/10, Traffic Rank: 48368). A link to your website and another link to your article page. • Avoid duplication of content. • Gain two one-way links to your blog, one at the front page and another one at the article page. It’s a good thing to bookmark your popular articles at social bookmarking sites. You expose your articles to those who don't visit your site. You also allow fans of the bookmarking sites to view your articles. The other thing is that you create one-way links to your site. All you need to do to bookmark your article is to submit the URL of the article and not the URL of your site. You are normally asked to supply the title of the article and a short description of the article. Dropjack.com: It accepts article and news items. (PageRank: 5/10, Traffic Rank: 135243). When you submit articles check the site to ensure that they are relevant to the site. The other helpful hint is to check the tags. Submit articles to match popular tags listed as these are the subjects that the readers are interested. When you launch a blog the first thing to do is to submit your sitemap to the four major search engines. They are Google, Yahoo, MSN and Ask. When you submit the sitemap of your blog you allow the four biggest search engines to know your entire site. This is also to allow the search engines to identify the pages and content of the site. When your site is indexed it will facilitate search engines to do a better searching job. When someone looks for particular information using certain search words and when the search words match with your key words the search engine is able to retrieve your content and present it to the searcher. Before you submit your blog or site to search engines you enter your site into their search query. When your site appears in this search results it means your site has been indexed and is not necessary to submit you site again. You can consider submitting your site to Alexa, Cuil and Wikia beside the four biggest search engines. 1. Time: This is a weekly American news magazine. A Taiwanese mentions that: it is a heavyweight international news magazines read even by upper secondary school students so you can’t afford not to read it. Time magazine is famous for its annual “Person of the Year” cover story. It was founded by Briton Hadden and Henry Luce in 1923 as the first weekly news magazine in the United States. 2. Newsweek: It is mentioned in the newspaper that its style is more liberal than Time, but more conservative than U.S. News & World Report. It is said that Newsweek provides not only news but a magazine full of lifestyle trend. The first issue was published on February 17, 1933. News-Week as it was originally known was founded by Thomas J.C. Martyn. 3. Harvard Business Review: It is published by Harvard Business School Publishing since 1922. It is a monthly magazine famous for articles contributed by scholars and management thinkers such as Peter F. Drucker and Michael E. Porter. When you read the magazine you are also reading the same material as read by the CEOs around the world. 4. The Economist: According to someone from Aveda who loves reading magazines, he says when you have no time to read then read only one magazine and that is The Economist. It is able to interpret world events that no other commercial magazines can take its place. The magazine was founded in 1843 by James Wilson. 6. Wallpaper*: A monthly magazine about travel, design, entertainment, fashion and media. The magazine was started by Canadian journalist Tyler Brule in London in 1996. Its reporting style is short and amusing. 7. Monocle: The magazine provides a world perspective on international affairs,design and culture. It was founded by Tyler Brule, a Canadian journalist and entrepreneur in 2007. 8. The New Yorker: The magazine is about politics, social issues and popular culture. “The Talk of the town” is the most popular column. It is founded by Harold Ross and his wife in 1925. 9. Vogue: This magazine, founded by Arthur Baldwin Turnure in 1892, is more than 100 years old. It is about fashion and lifestyle and it is the most influential female magazine. 10. Fortune: It is founded by Henry Luce in 1930. It is a business magazine famous for its Fortune 500 list. One prominent magazine which is missing in the list is Forbes. B.C. Forbes founded the magazine in 1917. It is one of the most quoted magazines for, among others, a list of The Richest People in America (The Forbes 400) and a list of The World’s Billionaires. Mushrooms are used widely in cooking notably in Chinese cuisine. People enjoy eating mushrooms for their flavor and texture. Eating mushrooms is also beneficial for your health. Most edible mushrooms are commercially grown. The most popular one is the Agaricus bisporus or the white button mushrooms because it is grown in controlled, sterilized environments. The other well known species are crimini (brown mushrooms) and portabello. According to the latest findings, white button mushrooms reduce the risk of breast cancer and prostate cancer. Shiitake mushrooms, another cultivated species, have been widely used for a long time by the Chinese and Japanese to treat colds and flu. Mushrooms offer good quality protein, vitamins, unsaturated fatty acids and fiber. They are low in calories, sodium and fat. So, mushrooms are ideal food for people following a weight loss program. Mushrooms are also excellent source of potassium, which helps to lower elevated blood pressure and reduces the risk of stroke. You can also get rich source of riboflavin, niacin and selenium from mushrooms. Selenium is an antioxidant that works with vitamin E to protect cells from the harmful effects of free radicals. Eat mushrooms regularly to strengthen your body and fight off illness and maintain physiological homeostasis. Be careful with wild mushrooms because many species are poisonous and only experts can tell the difference between edible species and poisonous ones. Mushroom eaters are called mycophagists and the act of collecting them in the wild are called mushroom hunting, mushroom picking or just mushrooming. My favorite dish is mushroom soup. I usually ask for a second helping.